The flat-headed cat is a small cat weighing up to about 2.2 kg (4.8 lb). Its distinctly elongated and flattened head and its small, rounded ears make it one of the more easily recognizable small cats. Its long fur is thick and soft. The fur is reddish brown on top of the head, dark roan brown on the body, and mottled white on the underbelly. Many of the body hairs are tipped with white or gray. The muzzle and chin are white. Two prominent whitish buff streaks run on either side of the nose between the eyes. The flat-headed cat inhabits secondary forest/scrub and primary freshwater swamp forest within lowland coastal floodplains. Most collection records for the flat-headed cat are from swampy areas, oxbow lakes and riverine forest. It has also been observed in disturbed primary and secondary forests and in oil palm plantations. The diet of the flat-headed cat is assumed to include fish, crustaceans, frogs and rodents. It may eat birds, especially poultry. The flat-headed cat is thought to be nocturnal and to hunt along riverbanks. Occurring in Southeast Asia, the flat-headed cat is found in peninsular Thailand and Malaysia and the islands of Borneo and Sumatra (Indonesia). Water pollution, especially by oil, organochlorines and heavy metals associated with agricultural run-off and logging activities, poses a serious threat to the flat-headed cat through contamination of its prey. The clearance of waterways as human settlement expands into forested areas is also a problem. *** The flat-headed cat's toes are more completely webbed than the fishing cat’s (Nowell & Jackson 1996) . *** Its morphological adaptations suggest that the flat-headed cat's diet is composed largely of fish, and thus that its distribution is closely associated with water (Sunquist & Sunquist 2002) . *** The flat-headed cat is more aquatic than the fishing cat (Humphrey & Bain 1990) . The flat-headed cat’s total effective population size is estimated at below 10,000 mature breeding individuals (IUCN 2005) . The flat-headed cat is restricted to Southeast Asia and is found in peninsular Thailand and Malaysia and the islands of Borneo and Sumatra (Indonesia) (Meijaard et al. 2005) . 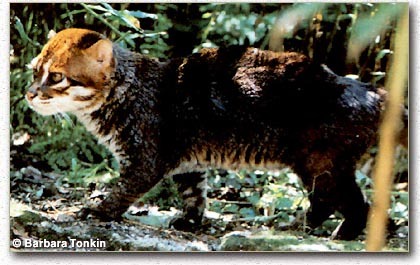 The flat-headed cat is found in the Indo-Burma and Sundaland Biodiversity Hotspots (Cons. Intl. 2005). Approximately 56 days (captivity) (Nowell & Jackson 1996) . Three flat-headed cats each lived to 14 years (captivity) (Sunquist & Sunquist 2002) . The flat-headed cat is thought to be nocturnal and frequently to hunt along riverbanks (Nowak 1999) . Prey are carried at least 2 m (6') away from the water by the flat-headed cat before being eaten, preventing slippery prey from easily reentering the water (Muul & Lim 1970, Humphrey & Bain 1990) .